Many of you are using laptops instead of desktops. It’s no wonder that laptops have become so popular. They’re every bit as powerful as desktops and cost the same or even less than a comparable desktop. And when it comes to portability, the laptop wins — hands down! We recommend leaving your laptop plugged in when possible. But if you need to take your laptop with you’re away from home, here’s a tip that will help you extend your laptop’s battery life. and clicking on the Battery Saver Button. While you’re there, don’t forget to lower the brightness setting. 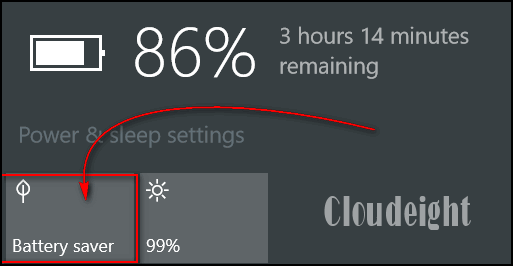 Dimming the display brightness is another great way to extend your battery life. You can tell when Power Saver is turned on by the Green Leaf that appears over the battery icon, see? We tested this with one of our laptops and we got almost 2 extra hours of battery life. Great tip, what a difference, thank you! Any way to make it sticky, to have it still activated, when restarting. Ta.